This post takes a closer look at the Amulet series by Kazu Kibuishi. The sixth volume of a projected 10-volume series just came out. 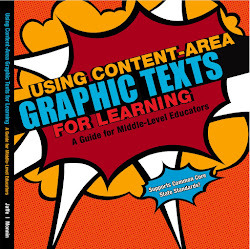 While detailed in its own right here, please visit Using Graphic Novels in Education: Amulet for even more lesson/discussion suggestions, a break down of the six volumes to date, and Common Core Standards the lesson suggestions address. Amulet is an award-winning graphic novel series about Emily and her brother Navin who, through extenuating circumstances, find themselves battling for the freedom of a parallel world and face mounting dangers with new found friends. This coming-of-age series continues to win awards. The Young Adult Library services Association named it one of Best Books for Young Adults in 2009. 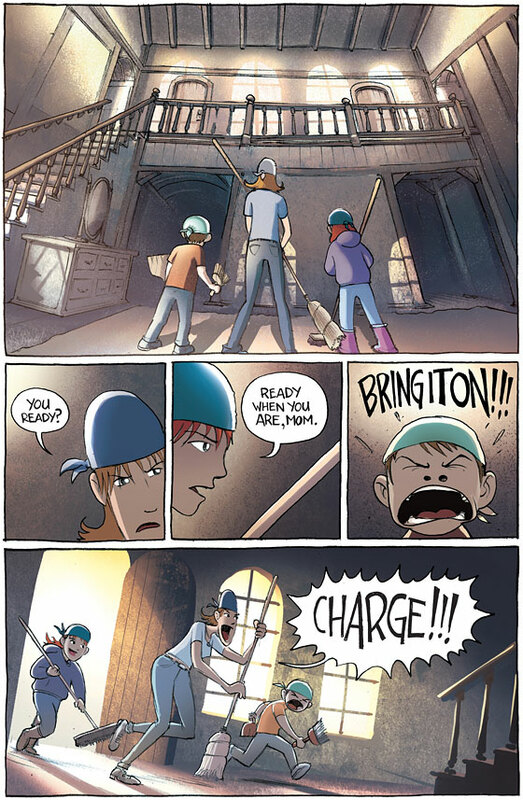 In 2010, it won a Rhode Island Children’s Book Award and was included in a Library Journal list of “Graphic Novels for Reluctant Readers.” In 2011, it received a Young Reader’s Choice Award, and in 2013, it was ranked fourth on Goodreads’ “Best Graphic Novels for Children” list. These books received an Eisner nomination and are currently New York Times bestsellers. 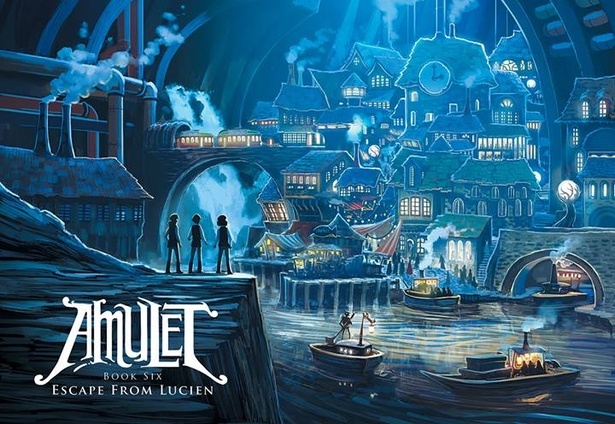 Amulet is about a determined girl named Emily and her younger brother Navin, who move into their great-grandfather’s country house outside a town called Norlen after their father’s death. While the locals believe the house is haunted, Emily and Navin’s mom, Karen, has no choice but to fix up the old house and move in. Times have been hard without their dad, and the home is all they can afford. While cleaning the cobwebs and dust, Emily discovers a locket — the Amulet — and Karen, Emily, and Navin are transported into an alternate world through a small door in the basement. They soon discover that they’re descended from a line of Stonekeepers, people charged with protecting the alien world. They also find shortly after their arrival that something is terribly wrong. In the six volumes to date, we learn about Emily’s family’s past, her great-grandfather’s abrupt disappearance, and the power of the Amulet. Emily and Navin, with the help of extraordinary supporting characters, also learn about their own powers — powers to cope, powers to survive, powers to protect others, and powers to grow. Amulet introduces us to wonderfully faceted characters — robots that bring to mind Star Wars; steampunk robot houses; elves; anthropomorphic foxes, rabbits, and cats; all sorts of flying machines piloted by children and robots; and more. 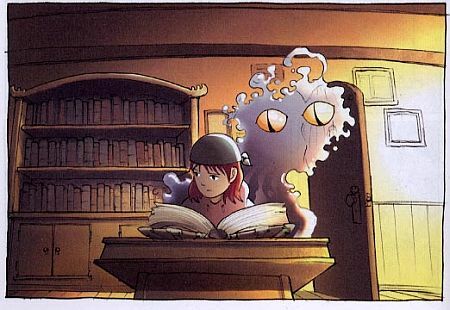 The reader also encounters amorphous voices and characters who feel like pure evil. 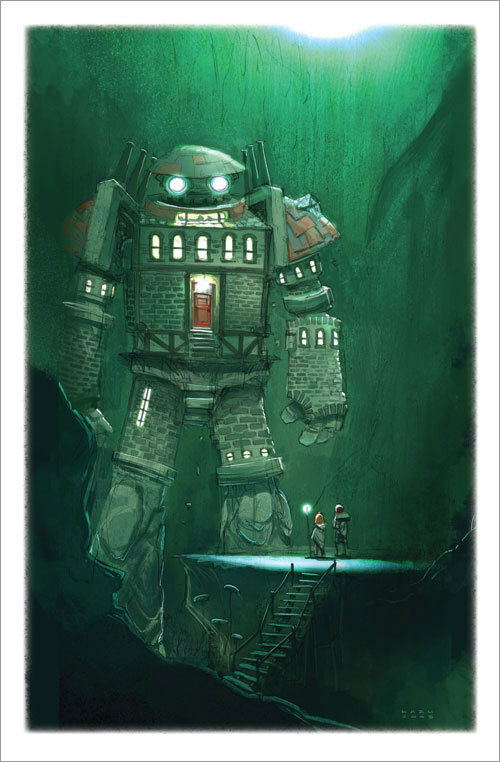 Amulet’s plot and diverse characters are achieved through rich dialogue as well as lavish art. Through exciting twists and turns, Amulet deals with familial responsibilities, coming of age, finding the courage to face unwanted challenges, and the importance of teamwork. In each volume we ride a roller coaster of plot twists, along with outstanding art, graphic design, and character development. These books are geared for kids 7+ and can be easily integrated into language arts and social studies lessons for grades 2-6. 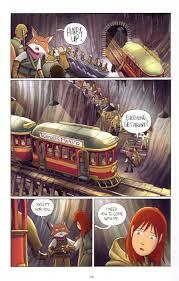 That said, they’re wonderfully entertaining for readers of all ages, and would encourage outside-of-school reading. In short, Amulet is a about finding the courage and the means of facing one’s challenges and fears. It’s a series about heroes and responsibility and learning to trust. It’s a series about the benefits of teamwork when facing the challenges of growing up. How to figure out what it takes to be a hero. In each volume, Emily and Navin must overcome challenges. Plot the challenges each face and the strategies they use when facing them. Discuss and evaluate the effectiveness of their strategies. Brainstorm your own. You may want to do this for Trellis and Max as well. Over the course of the series, discuss how Emily and Navin have changed. Have students bring in evidence to support their positions. Over the course of the series, we frequently question the motivations of Trellis and of Max. Discuss why Kibuishi has us question their motives, and discuss how Kibuishi creates these ambiguities. In each book the characters are forced to make decisions and must then deal with the consequences. Plot the decisions and consequences of the characters’ actions. What can you learn from them? In Book One: The Stonekeeper (p. 72), the Voice tells Emily, “Being a Stonekeeper is a responsibility you mustn’t take lightly.” What might these responsibilities be? Why can’t they be taken lightly? In Book Two: The Stonekeeper’s Curse (p. 99), Leon Redbeard and Emily discuss the choices she is facing. Discuss what Leon means when he says, “You must believe that you are here by choice and not by circumstance…You must…take control of your life and the stone will follow.” What might Leon’s implications entail? In Book Three: The Cloud Searchers (p. 145), Mom tells Emily that, “If you can find the confidence to trust yourself, you can make it through any situation, no matter how bad things seem.” Discuss how confidence can help you through situations. Give specific examples. In Book Five: Prince of the Elves (p. 58), Vigo tells Emily that, “Sometimes personal desires and ambitions can cloud the judgment of even our brightest minds.” Explain what Vigo might mean, giving examples to support your interpretation. In Book Six: Escape From Lucien (p. 20), Leon tells Emily to trust her instincts and to “Just remember that these people need your help to begin with… not making decisions can be the worst decision of all.” Have students explain what Leon means, giving examples to support their opinions. Search, chart, and discuss literary devices used in Amulet. You may want to compare other ways to write the same ideas in an effort to show the value of these devices. Foreshadowing can be found in each of the volumes both in the text and the images. Search for and discuss examples of foreshadowing and have students create their own examples. Puns and idioms are rife in these books. Search, define, and discuss these literary devices and have the class brainstorm others. Social Studies: Compare and contrast the way the cities of Cielis, Alledia, Lucien and Kanalis are designed, run, and maintained. Ask students: How are these cities and the daily lives of their inhabitants similar and different from where you live? Social Studies: In Book Four: The Last Council (p. 81), Vigo recounts how Silas criticized the Council for making decisions based on its fears. Discuss how political and social decisions are made and why making decisions from fears may or may not be the best way to legislate. 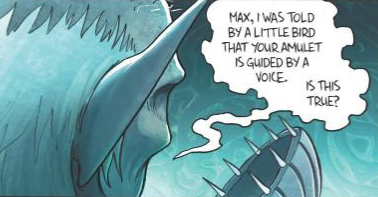 Social Studies: In Book Five: Prince of the Elves (p. 22), we see a flashback of Max Griffin before the Guardian Council. He is being sentenced “…to fifty years in the ice prison of Korthan for aiding in the escape of war prisoners. You will also face trail in prison for your actions leading to the deaths of four soldiers….” Discuss whether this sentencing and punishment is just or unjust (giving examples to support your opinions). You may also want to discuss the choice of location for Korthan (and other) prisons. History/Social Studies: In Book Five: Prince of the Elves (p. 58), Vigo tells Emily that, “Sometimes personal desires and ambitions can cloud the judgment of even our brightest minds.” Have students search for examples in history that support Vigo’s statement. History/ Social Studies: In Book Six: Escape from Lucien we meet the Resistance Army. Discuss why it is called a “Resistance Army” and compare this army (its structure, goals, and missions) to resistance armies throughout history. Science: In Book One: The Stonekeeper, Karen is stung by an “arachnopod.” In Book Two: The Stonekeeper’s Curse we learn a little more about arachnopods.H ave students create their own original deadly animals with names based on existing scientific taxa. Have students describe what these animals look like, where they live, what their deadly powers might be, and what we might do to protect ourselves from those deadly powers/threats. For more fun or if seeking resources for deeper literary analysis, here are some books/poems similar to Amulet that we’re sure you’ll enjoy. Zita: Space Girl by Ben Hatke: A graphic novel series about a young girl who is also is transported into an alternate world, and reluctantly finds herself a hero. A Wrinkle in Time by Madeleine L’Engle: A book in which a brother and sister must travel to an alternate world to find and rescue their scientist father. The Road Not Taken by Robert Frost: A poem about choices one must make. The Hobbit by JRR Tolkien: A book in which a humble hobbit must join with forces with elves, dwarfs, and others to go on an adventure and save Middle Earth. The Harry Potter series by JK Rowling: A coming-of-age series with magic, adventure, good, and evil. Alice in Wonderland by Lewis Carroll: A story in which a girl falls through a rabbit hole and finds herself in an alternate reality. The Lion, The Witch and The Wardrobe by C.S. Lewis: A book in which siblings transport through a wardrobe into an alternate world that they must save from an evil queen. The Oz series by L. Frank Baum: Including the Wonderful Wizard of Oz, this series follows the adventures of several children, including Dorothy, in the magical Land of Oz. In the meantime, please leave your own suggestions and reactions in the comments below. You are such an educator. I still learn things!